We are proud to introduce international furniture manufacturers Fermob and Vincent Sheppard to Western Australia. The French furniture manufacturer Fermob has spent more than 25 years perfecting their craft – creating metal outdoor furniture that meets the highest standards of design, style, quality, and comfort. Fermob stands out among the rest because of its unique, patented designs and vibrant colours, which are intended to infuse your environment with a fun and exciting tone. Their outdoor furniture is designed for the outdoors, meaning that your furniture will work with and enhance the aesthetic of your environment. Fermob seeks to be more than an outdoor furniture manufacturer; they aim to enrich the charm and refinement of your life – from a cup of coffee under a shady tree, to a relaxing moment by the pool, to a long lunch with family and friends. Vincent Sheppard has been designing and manufacturing furniture since 1992. The company is the worldwide leader in the manufacture of Lloyd Loom furniture, a technique where Kraft paper is twisted around a metal wire and woven into unique furniture pieces. The design arm of Vincent Sheppard is in Belgium, while their main manufacture plant can be found in Indonesia, a country known for its rich weaving traditions. By constantly challenging itself and its aesthetics Vincent Sheppard presents young, contemporary furniture collections that suit all modern needs. They combine a clear focus on quality, comfort, design and craftmanship using age-old-techniques. 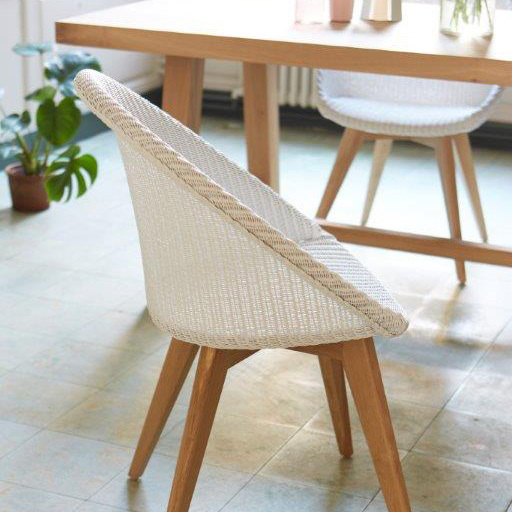 Whether for dining or lounging, indoors or outdoors, with each piece of Vincent Sheppard furniture, the legacy of woven paper furniture lives on.